Playoffs - Round One Won! 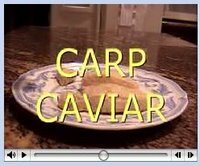 We made another Carp Caviar Promo to submit to Bottom Union. Maybe they'll post it. Hi, I'm doing some research into fishing related search 'keywords' e.g. 'fishing rod' for a client. I need to talk to people who regularly search for fishing related information. I've found some people via fishing rod but I need to talk to more. Can you suggest where else to try? Try GORP, the Fish Information Service, and the U.S. Fish and Wildlife Service. Hi #NAME#. Just found your site via loans. Although I was looking for loans I was glad i came upon your site. Thanks for the read!